IAFFE (International Association For Feminist Economics), 2008 ANNUAL CONFERENCE Torino, Italy. June 19-July 21, 2008.
International Gender Budgeting Conference, Gender Public Budgeting Responsible to Gender Equality Congress jointly organised by Bilbao Municipal Government and Biscay Regional Government, with the collaboration of the European Gender Budgeting Network on 10th and 11th June 2008 at Euskalduna Conference Centre, Bilbao, Spain. 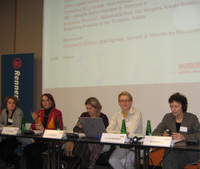 The Nordic-Baltic Network on Gender Responsive Budgeting organizes The First International Conference on Gender-Responsive Budgeting and Social Justice in Vilnius (Lithuania) on 10th and 11th January 2008 at Mykolas Romeris University. Meeting of the European Gender Budgeting Network at the margins of the European symposium on gender budgeting in Frankfurt from 4-5 June 2007 on the theme: “Let's share the benefit - with gender budgeting towards social justice and equal opportunities”. The main objective of the symposium organized by the German Federal Ministry for Family Affairs, Senior Citizens and Youth was the introduction of gender budgeting within the European Union. Pre-announcement and pre-invitation of the Ministry of Finance in Finland who will host an International conference: The process towards Integrating a Gender Perspective in the Budgetary process (Gender Budgeting),-the Nordic Experience. 8-9th of November, 2006, in Helsinki, Finland.